Approximately three lakh Indians immigrated and settled in Australia in between 2000 to 2016, as per official figures, which announced India added the highest number of individuals on the skilled visa to Australia. Many of them are well-spoken in English, and many of them have also got their own homes in the nation, it stated. The data got at a time while Australia is observing a robust public debate on immigration amidst interest in jobs and overpopulation in important cities. As familiar as 291,916 Indians immigrated to Australia among the years 2000 and 2016, of which 154,012 people have obtained citizenship of Australia, as per the data issued by the Australian Bureau of Statistics yesterday. 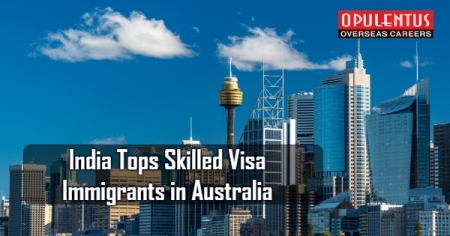 For those reaching to the country of Australia by the skilled visa, India with 234,395 people which is around 19 percent got the first rank, accompanied by England and China at 160,558 which is around 13 percent and 146,842 which is around 12 percent individuals, sequentially, it stated. Below the programme of family visa, China with 95,532 immigrants which is around 14 percent listed first, accompanied by the UK about 60,108 which is around 8.8 percent and India about 56,406 which is around 8.3 percent, the numbers announced. Of a sum of 45,816 migrants who reached to Australia below the visa programme of humanitarian, there were just 1,097 Indians. Iraq surpassed the list in the class with 37,751 immigrants, the data presented.